The popup reminder window is automatically displayed when enabled for a task or event. The Preview button in the popup reminder settings can be used to see how the popup reminder will appear. 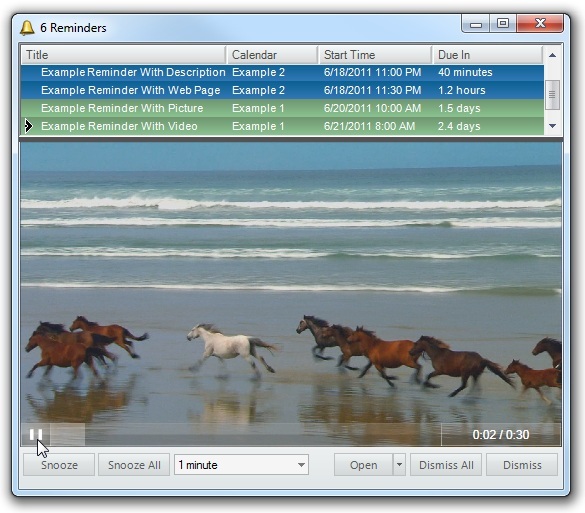 The Recent Reminders window can be used to redisplay previously snoozed or dismissed popup reminders. The popup reminder window is displayed to remind you of upcoming or past-due events and tasks. 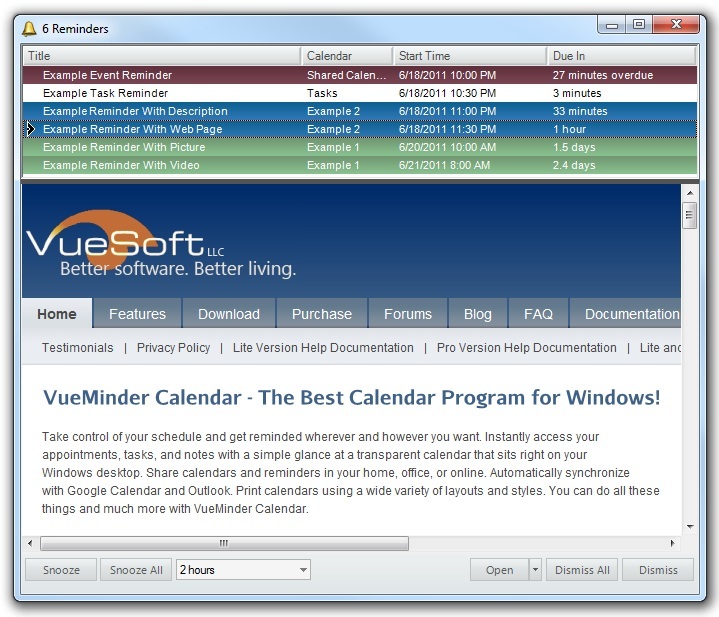 Popup reminders can be configured in the Event Editor and Task Editor windows. Reminders can have associated content, such as a picture, song, video, or web page. They can also show the complete event description or task details, which can contain formatted text, links to files or websites, pictures, and more. Reminders can recite the event or task details, using text-to-speech voice synthesis. This can be useful if you're away from your computer but within hearing distance. It can also be helpful for anyone that has vision problems. By default, all reminders will be combined and listed in one instance of the popup reminder window. You can choose to display individual reminders in separate popup reminder windows via a Reminder Option. When multiple reminders are displayed, you can select a reminder by clicking its row in the list. The selected and currently displayed reminder will be indicated with a black arrow. 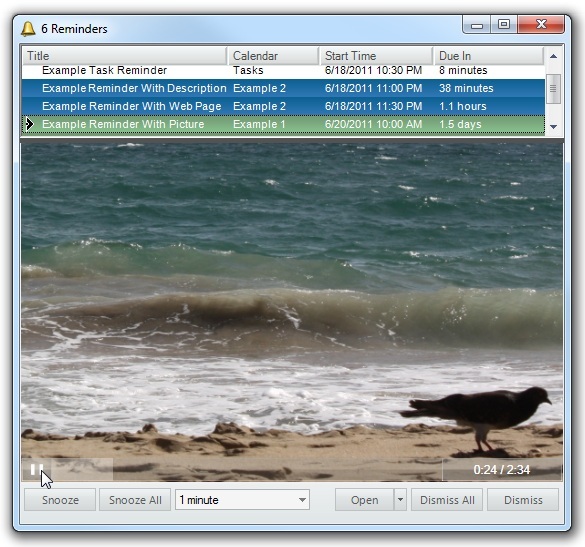 Depending on what content was selected to display for the current reminder, the reminder content area of the window will vary. If you'd like to make the content area larger or smaller, you can resize the window. The content will automatically resize to fill the available area. The aspect ratio of pictures and videos will be preserved when resizing. The date format displayed for the Start Time is controlled by a Calendar Option. The initial placement of the popup reminder window can also be controlled with a Reminder Option. You can choose to have the window initially docked to one of the corners of the screen, or it can redisplay in a previous location. The visible columns, as well as whether the window should always appear on top of other windows, can be adjusted in the Reminder Options. When a reminder comes due, the reminder window will display and the reminder will be selected in the list for display. If there are other reminders due, they will also be listed and automatically sorted by starting date and time. Or, if the Reminder Option has been set to display reminders in separate windows, only the reminder associated with the window will be listed. You can switch to displaying a different reminder by selecting it from the list, if applicable. The actively displayed reminder will be indicated with an arrow to the left of the reminder's name in the list. Each reminder in the list will be formatted to match the appearance of its associated event or task. If you double-click an event or task in the list, it will be opened in the Event Editor or Task Editor, where additional details can be viewed or modified. Title - The title of the associated event or task. Calendar - The calendar of the associated event or task. Start Time - The time the event is scheduled to begin or the task is due. If the event is all-day, or if the task doesn't have an associated time, only the date will display. Otherwise, both the date and time will be shown. Due In - The amount of time left until the event begins or the task is due. If the current time is past when the event started or the task was due, this will indicate the item is overdue. When an item is due in less than a minute, the Due In column will show a second-by-second countdown. Below is an example of a reminder that includes an event description. If this reminder were for a task, the task details would be displayed instead of the event description. In both cases, the text is formatted as entered in the Event Editor or Task Editor, and any links contained in the description can be clicked. Links to files or other events, tasks, notes, and contacts will also be clickable. In addition, the details can be printed, copied to the Windows clipboard, or emailed, using the buttons below the detail text. Below is an example of a reminder that includes a picture. You can optionally specify a song or wav file to play along with the picture when defining the event or task. In this example, a song is also included. The controls for adjusting the song playback are at the bottom of the picture. Below is an example of a reminder that plays a video. The video will start as soon as the reminder is activated. You can use the playback controls at the bottom of the video to pause or skip to a different part of the video. Below is an example of a reminder that has an embedded web page. The web page can be navigated just as you would in a normal browser. You can click links or right-click to browse forward or back. This type of reminder can be useful if you do online banking and have bill reminders. By default, up to 4 reminders will fit in the reminder list without needing to scroll. The list height can be adjusted to make room for more reminders. Or, if you seldom have multiple reminders, the list height can be decreased to make the window smaller. To adjust the list height, click and drag the bottom border. The height will be remembered and used whenever the popup reminder window is shown. Reminders can be snoozed by clicking the Snooze button. When the mouse is hovered over the Snooze button, a popup balloon will appear showing when the reminder will be displayed again, if snoozed with the currently selected snooze duration. You can select a different snooze duration from the drop-down list. 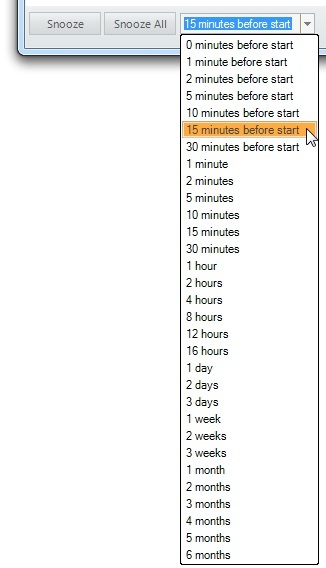 You can also type in your own custom snooze length, using any number of minutes, hours, days, weeks, or months. The maximum snooze length is 12 months. After snoozing a reminder, it will be added to the Recent Reminders window, along with when the reminder will be displayed again. You can redisplay the reminder, without waiting for the snooze time to be reached, by selecting the reminder and clicking the Redisplay button the Recent Reminders window. You can also undo snoozing via the Undo command on the Edit menu. If there are multiple reminders displayed, you can choose to snooze them all by clicking the Snooze All button. Reminders can be dismissed by clicking the Dismiss button. Recently dismissed reminders will be displayed in the Recent Reminders window. If you accidentally dismiss a reminder and would like to re-enable it, you can select the reminder and click the Redisplay button in the Recent Reminders window. You can also undo dismissing a reminder by using the Undo command on the Edit menu. The reminder will immediately re-appear. The events and tasks for dismissed reminders will be automatically marked as completed if the corresponding program option is set. If there are multiple reminders displayed, you can choose to dismiss them all by clicking the Dismiss All button. After being dismissed, the reminder won't be displayed again, unless its for a recurring event or repeating task, in which case it will display before the next occurrence. You can view and modify the event or task associated with the selected reminder by clicking the Open Item button. Events will be opened in the Event Editor and tasks in the Task Editor. Note that this won't dismiss the reminder. Any changes made to the event or task will be reflected in the reminder window automatically. 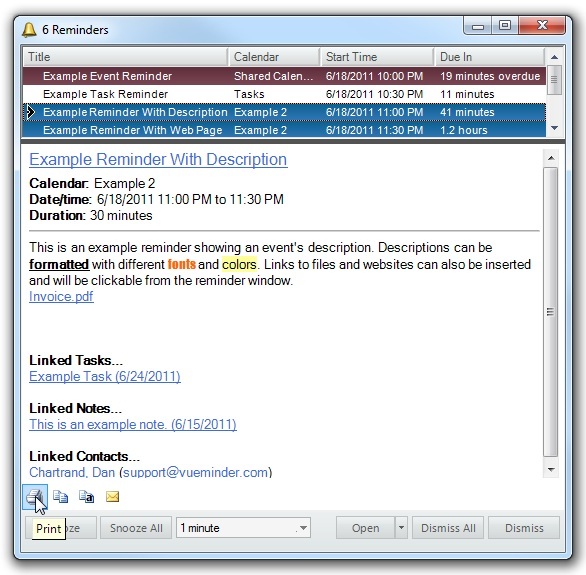 The event or task associated with the displayed or selected reminder can be opened or deleted. To open or delete an event or task, click the provided button. If the desired command is not reflected in the button's label, you can click the down arrow and select either Open or Delete. When deleting an event or task, you will be prompted to confirm deletion. The reminder will be removed from the list and the popup reminder window will be closed if there was only one reminder listed. If you accidentally delete an event or task, the deletion can be undone using the Undo command on the Edit menu.